As I mentioned before, I thought media pundits should get a life when President Obama wore a tan suit last week. Well, what follows is the letter I sent to the White House. In light of the recent media frenzy about your tan suit, I thought I'd write and mention that I like your tan suit. I also think you should give the media pundits more to do, as they clearly have no original thoughts of their own. Therefore, I challenge you to wear a checkered or plaid suit along with a bow tie to your next press briefing or news conference. If you would do that I would gladly give you $100 or make a donation in that amount to your favorite charity. Well, President Obama held a news conference yesterday. What caused an astonishing amount of commentary from the media outlets was his tan suit. Don't these people have anything better to do? I actually liked his new suit. I used to have one a lot like it. The cleaners lost my suit. I was so bummed. Well, I finally got the ebooks done for Seampunk Trails and Six Guns Straight From Hell 2. It's not that they're that hard to do, but everything kind of converged on me at once. I was trying to get a story done by a deadline, which I missed. I hate missing a possible pro sale. But, I got everything else done. Now if a few thousand people would buy them. Fat chance. I don't have any more publishing projects for a while. Maybe I can get some writing done in the next couple of months now. 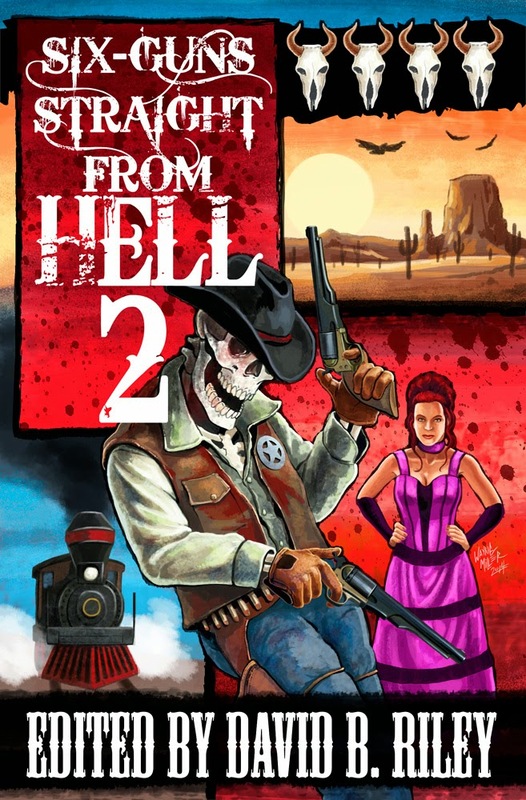 Six Guns Straight From Hell 2 is finally here. Edited by yours truly, everyone can now order their copies from their favorite online retailer. So, order a couple hundred today. The 2015 calendars are starting to turn up. It seems to me they could wait til after Halloween. I used to always buy these really cool flying saucer calendars from the folks at Brown Trout. Last year they had a cover for a flying saucer calendar, but the calendar itself never made it to market. I don't know why. They don't seem to be planning any more. I sure wish I could get a good quality calendar with flying saucers on it. Well, I got my schedule for Steampunk With A Twist Con coming up in September. Some interesting stuff going on. For those in the Colorado or Utah areas, this one is in Grand Junction. A link to their website is below. I had my doubts about this when I was first invited, as they seemed rather disorganized. Well, it seems to be shaping up. I'm looking forward to it. My own schedule is I'm hosting a reading for the contributors to Science Fiction Trails, Steampunk Trails & Six Guns Straight From Hell 2. All of these are products I've published. Also, we're having a panel on my very favorite topic--The Great 1897 Airship. I'm also sitting on panels about Victiorian versus western steam and getting past gatekeepers. Overall, they've got a lot of stuff going on, although they seem quite thin in terms of dealers attending, based on what's listed on their website. Lodging is rather reasonable that time of year in Grand Junction. There are some really cheap deals to be had in the area if one doesn't want to stay at the official hotel. The official site is only $59, so lodging shouldn't be an issue. Okay, yesterday's post may have been a bit odd. There was a skeleton and no explanation. I was going to put up a bunch of skeletons and ask folks to pick which one they liked. Well, something came up and I forgot to finish it. I've been really busy the past few days. So, I've deleted it and maybe we'll try it again later. For some reason a lot of folks don't seem to believe there are rattlesnakes in the mountains of central Colorado where I live. Well, I've seen 'em. So, I wasn't all that surprised when I heard this rapid rattle sound from outside the screen door on my porch. 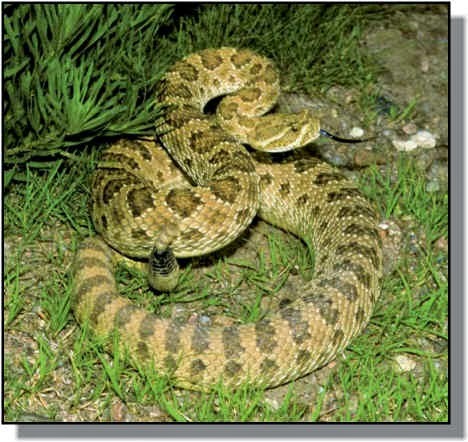 Sure enough, there was a coiled up western rattler [also called prairie rattler]. I just made sure the screen was closed properly and went about my business. An hour later I went and looked and it was gone. Now, when I mentioned this people were shocked that I took such a nonchalant view to this. "Why didn't you kill it?" I was asked. Well, that snake wasn't hurting me. In fact, as I really hate mice, and snakes eat way more mice than birds of prey and other predators, I don't view snakes as all that bad. Since it wasn't bothering me, I didn't bother it. I've always wanted to find a meteor. I never seem to. 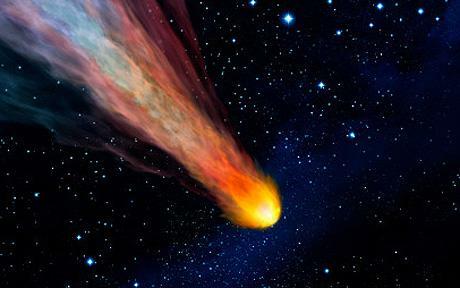 The viewing of the recent meteor shower was a bust. I still remember last winter when a little blue glowing piece of something came down in the parking lot where I work. I thought it would have left some kind of mark in the snow, yet I could not locate anything. I could hear it sizzling as it came down--it was that close. Yet, I never found anything. I'm told at that point they're often just the size of a grain of sand. Still, every time I know there's a meteor shower I find myself looking skyward. Supposedly there's been a meteor shower going on. Alas, every time I go outside and look for meteors I don't see any. Very disappointing. Updating my post from Saturday, we should be able to release Six Guns Straight From Hell 2 on September 15th. Well, I've mentioned the new Steampunk Trails. I haven't talked much about a new anthology I've been working on. It's called Six Guns Straight From Hell 2. I'm just about done with the editing and the cover is in its final stages. I can't wait to send it to the printer. It's got guns and ghosts and mules and dogs and lawmen and mines and vampires and Indians. It'll be out soon, but don't have an official release date quite yet. Okay, I've railed about the Postal Service more times than I can count. This time, my commentary is a little different. I've long maintained that USPS has a hell of a thieving problem and they don't seem to want to admit it. To their credit, they've improved their package tracking, or so they say. I just sent a package to California. I mailed it Monday and it got there Thursday. I think that part is fine. HOWEVER, I had a tracking number. At no time during the entire routing of this package was it ever scanned. Nothing comes up at the website. Yet, the recipient emailed me that he got it. So, whilst I'm glad it arrived, this tracking service is not what it is cracked up to be. It's been a cold and soggy summer. In some ways that's better than hot and dry. We haven't had the horrific wildfires like we saw last summer. Still, summer should be warm and this one isn't. I live at high altitude in the mountains and it's never all that hot, but this summer has been extremely cold. I've even had to use my heater a few times. Why is it called Steampunk Trails? I was asked. Well, it all started a long time ago when I put out a cross genre western magazine. I took all types of stories, but the submissions got more and more horror oriented. Anyway, this annual magazine was called Trails: Intriguing Stories of the Old West. It wasn't very popular. At the same time I was noticing the disappearance of the western sci fi story. All of the so-called weird westerns were suddenly horror--and very dark horror at that. That's when I switched to an all science fiction format and Science Fiction Trails was launched. I published 11 issues of that magazine (it was also an annual). With the last issue, I decided to end publication as I tired of struggling to fill the magazine. Writers just weren't interested, so I decided to quit pounding my head into the wall. So, last year, when we decided to try a steampunk magazine, the trails brand continued.with it. Frankly, we couldn't really come up with anything that seemed any better. We thought about steampunk stories, but that's a bit of a misnomer as the new magazine isn't all fiction. So Steampunk Trails was born. And our second issue just came out. As anyone who reads this blog should know by now, I am the publisher of Steampunk Trails magazine. The new issue has just been released. Order a copy. Better yet, order 10. Available from Amazon. and most online retailers. Print edition is out now, ebook will be available August 15th. 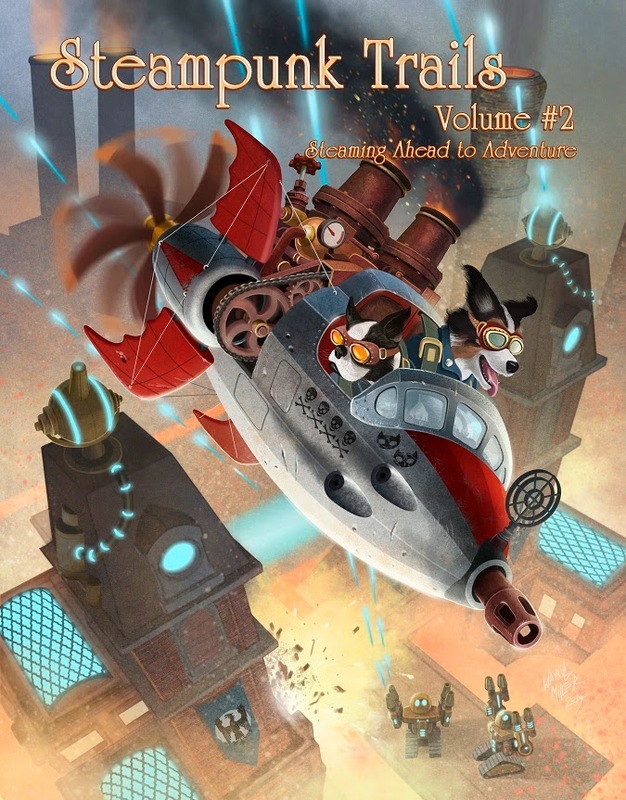 The second issue of Steampunk Trails brings a world of steam and airships and clockwork contraptions within your grasp. Discover kidnapping schemes foiled, mutinies thwarted and what happens when the spring has sprung in a clockwork heart. Fly through the air with smugglers and pirates and honest captains. Read as legendary feats of human strength overcome soulless machines, and machines with souls protect their owners. Discover the true story of the Great Airship of 1897 and encounter some really short fiction all about fog machines. O.M. Grey, Peter J. Wacks, Lyn McConchie, David Boop, Jessica Brawner, Eric Aren, Jeffery Cook, Katherine Perkins, Liam Hogan, Henry Ram, and more fill this issue with tales from all over the world and adventures sure to get your heart racing.